At first glance, she’s a clunky antique best left buried with Gladys and Myrtle. 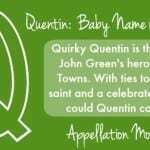 But there’s more to this regal appellation, and she might make a daring choice for a stylish parent. 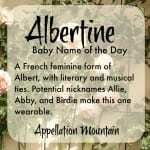 Thanks to Katharine for suggesting our Name of the Day: Alberta. Alberta comes to us from the same soup of Germanic elements that gave us Adelaide and Alice. The original masculine would’ve been something like Adalbrecht, composed of adal – noble – and beraht – bright. A feminine version has been around for centuries. 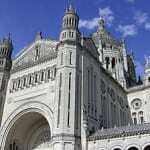 Saint Alberta died in Agen, France (then Gaul) during the Diocletian persecutions. She does not appear in the official Roman Catholic directory of saints; however, her son Caprasius and fellow martyr Faith are listed. The latter was especially popular in early medieval France. The Normans probably imported Albert and Alberta to England, where they were influenced by the unrelated Anglo-Saxon Aedilberct. Neither the feminine nor the masculine were especially common back in the day, but Albert, at least, is traceable throughout the Middle Ages. 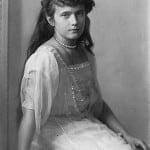 But Alberta was used, and Queen V herself named their fourth daughter Louise Caroline Alberta. After Princess Louise’s husband was named governor general of Canada in 1878, the province Alberta was named in her honor. (She was never known by her third name, but Louisiana was already taken.) Rumor has it that the princess wasn’t a big fan of Ottawa, but the name stuck. It lends Alberta a rough’n’tumble cowgirl vibe that might otherwise be inconsistent with our image of a Victorian princess. In the US, Alberta reached her zenith in 1910, stopping just short of the Top 100 at #104. Meanwhile, Albert was all the rage, ranking in the Top 20 from 1880 through 1923. He still places at a respectable #371 as of last year. Alberta, meanwhile, has not appeared in the rankings since 1970. Back in her heyday, Alberta’s friends would have been named Mildred or Florence, Ethel or Gladys. The gently old-fashioned choices we prefer – Emily, Jane, Caroline – were all less popular than Alberta in the early 20th century. Today, she has an unmistakable place name feel, along with some musical cred, thanks to Eric Clapton’s “Alberta.” (Of course, most Clapton fans probably call their daughters Layla.) With boy starbabies receiving names like Walter (Rainn Wilson) and Frank (Elvis Costello), it’s not unthinkable to imagine that some parents might dare revive Gertrude and Myrtle. After all, her three-syllable, ends-in-a construction is as popular as it gets. If Amelia and Antonia, Harriet and Beatrice can sound current, why not Alberta? 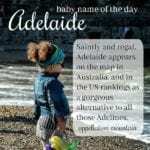 With nickname choices like Albie, Abby and Bertie, it might wear reasonably well on a girl born in the 21st century. I could definitely see my husband and I using Alberta somewhere in the middle of a daughter’s name. We’re actually from the province, but in a weird way that makes the name even more appealing. P.S. I looked up your Y!A question – how can Kaylie and Haylee get such POSITIVE responses and Isannah be so trashed? The mind reels. Emmy Jo, I went digging for some info on Isannah this morning and I’m now fascinated. I need to go pull some of the dusty tomes out of the reference section – it was indeed in use sparingly in Colonial America. I’m not 100% positive I’ll be able to come up with a satisfying origin, though – it looks like it may be a mash-up of elements popular at the time. Still, check back on 10/19 and I’ll do my best to do her justice. It’s a very pretty name. I first encountered this name in 8th grade while reading “Johnny Tremain,” but no one seems to know very much about its usage or where it was derived from (other than the fact that Paul Revere had a daughter by this name). Do you have some secret special way of checking census records? I’d be interested in knowing if this name was in use at all in the 1700’s – 1800’s. Also, if it is a combo name, were other combo names in use around this time? I did ask people’s opinion on this name on Yahoo! Answers, and they were very divided, but I don’t think many people had heard it before. I’m not sure if you can find out enough information on this one to make it a NotD, but I’d love to hear anything you do find out. Thanks! I love it, and I am shocked that I never considered this name- I am a big fan of names like this that are clearly feminine but strong and solid sounding. And the choice of nicknames is a great bonus! I might call her Bertie– I have a great-grandmother Bertha who went by Bert, and this could be a nice namesake choice, in the first or middle slot. Hmmm, it’s definitely going on my list! D’oh – I didn’t even THINK of Ally! I have an honorary Aunt named Alberta (she goes by Ginger, hates her name). I think it’s lovely. Strong, handsome, not showy at all, melodious too. Anyhow, I firmly like Alberta. She hovers nearby on my middle name list (Middles always honor for me, first names don’t have to, but can). Something Like Cecily Alberta, uberfrilly paired with handsome always works for me! Alberta’s aces with me. I’d nickname her Ally! No way! I didn’t know the Florida Gators mascots’ names – nor did I realize there was a he and a she version. Okay. Alberta might make a comeback in any of the other 49 states. Unless, of course, one of the parents follows college football in which case … Hmm, yeah that could be a problem. It’ll never fly here. Albert and Alberta Alligator are the mascots for UF!